My buddy Ben from PondRocket sent me an e-mail early last week. The e-mail had an excitable tone, which can be expected given the content. 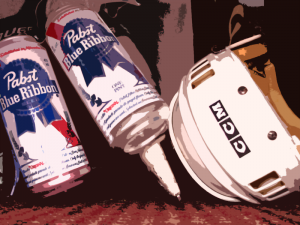 He had just completed the paperwork to sponsor the Pabst Blue Ribbon Colorado Pond Hockey Tournament, with naming rights to one of the rinks and the ability to sell his apparel on-site. Taking place February 19th and 20th in Summit County, CO, the PBR tourney will be PondRocket’s first event sponsorship — a very cool, very exciting step for any company. But beyond the wonderful business partnership he was embarking on, Ben was stoked about something else: as part of the sponsorship deal, PondRocket was putting a team into the tournament. Now Ben is no rookie when it comes to playing hockey, growing up with the game in his home state of Ohio. But after his competitive playing days came to a close, he spent several years working for various teams in the NHL, AHL, and ECHL, eventually settling with his family in Arizona, where he currently lives. It may be hard to believe, but pond hockey isn’t real big in Arizona. Hence, last week’s e-mail. I started to respond, then stopped. Despite living and breathing outdoor hockey, I’ve only played in one tournament. That number will triple in the next month, but as I type this, I am far from an expert in frozen surface survival. So with Ben’s permission, I posed this question to every pond hockey player I could find, with a huge assist going to the folks at the US Pond Hockey Championships (and their social network). So what kind of responses do you get when you ask the pond hockey community for advice for a first-time pond hockey player? So there you have it. 34 gems of advice for a first-time pond hockey player. Want to add to the list? Do so in the comments below. Some huge ‘thank you’s’ go out to Ben at PondRocket, everyone who contributed a tip, and the folks at the US Pond Hockey Championships, who assisted greatly in the gathering and aggregation of the responses. great post and best of luck Ben! Since you’re going to the mountains of CO for this, watch out for and don’t underestimate what the change in elevation can do to you. get there a couple of days early to get used to it a bit, and drink tons of water before you get there. Be sure to sneak some sips of Fat Tire when you’re there (not on the Pabst-sponsored-event-clock though) – best beer around. too bad it’s only in bottles (see point about cans above). Pingback: Top Three Things to Know for Pond Hockey Fans | The Ponds. The Rinks. The Roots.